Medea Benjamin Joins Us To Discuss Iran, Trump and more…. Today on Flashpoints, the war of words continues to escalate between the Trump administration and Iran in the aftermath of the US decision to abandon the Iran nuclear deal. 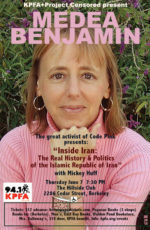 We’ll be joined by Medea Benjamin of Codepink and author of book Inside Iran: The Real History and Politics of the Islamic Republic of Iran.